Adlington Village Hall, Mill Lane, Adlington, Macclesfield, Cheshire, SK10 4LF. Note: in Google Maps this postcode centres on Adlington Hall. Adlington Village Hall is located on Mill Lane, at the entrance to Adlington Hall. 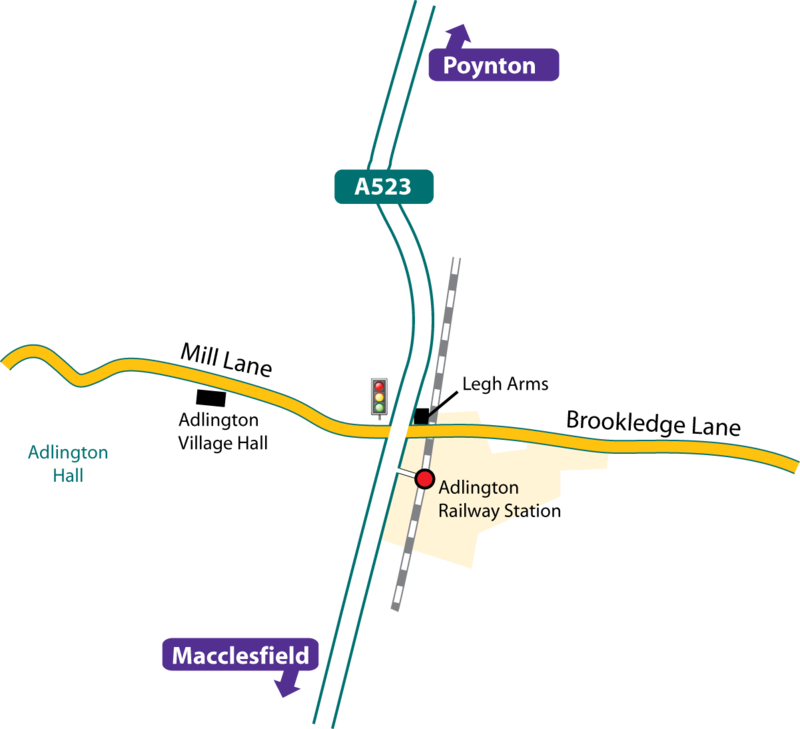 Follow the A6 to Hazel Grove, then take the A523 (towards Macclesfield) and continue to Poynton. Pass the Adlington Travelodge and at the crossroads with traffic lights (Legh Arms public house) turn right into Mill Lane. The Village Hall is on the left about 400 yards from the traffic lights, just before the entrance to Adlington Hall. Car parking is available behind the hall. Head for the A523 (Stockport Road) towards Manchester and carry straight over all the roundabouts. Pass the Butley Ash public house on your left. At the first set of traffic lights go straight on, still following the A523 for approx. two miles. At the next set of lights (Legh Arms public house) turn left into Mill Lane. The Village Hall is on the left about 400 yards from the traffic lights, just before the entrance to Adlington Hall. Car parking is available behind the hall.